When I checked the circuit board because the LED sensor light stopped lighting up, I thought that it was a defect in the relay, so I ordered this. 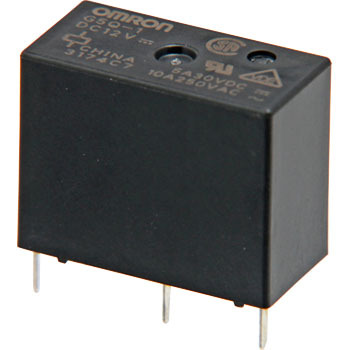 The relay that was originally attached is also made in China, and this is also made in China, but when looking at the data sheet of the manufacturer, durability (number of opening and closing) was good, so I chose this. As a result light fixed, it was good because it was operating properly. It is appreciated that you can order one by one. This review is about item#39067883. After the model change the current value increased and the range of use expanded. This review is about item#39067856. Case size and price We are satisfied with the current capacity. This review is about item#39067874. The consumption current of the coil is small and the control circuit can be simplified. It is tough for the board and I have never seen trouble. It is mediocre but excellent. It operates normally for several months. I use the copper wire instead of the foundation by soldering it to the terminal, I covered the terminal with a glue gun so that a force is applied to the terminal and it gets bent and does not break. This review is about item#39067865. This review is about item#39067822. I am satisfied with the case size and price and current capacity. This review is about item#39067847. I use it for 12 VDC as a bike, but I can use it normally. It was cheap and the contact capacity was large, so it was cheap to use.